These muffins are the perfect treat to make with kids and loved ones. 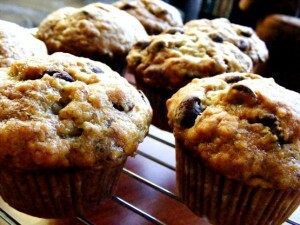 Filling and sweet, the banana chocolate chip muffins are perfect for breakfast or an afternoon snack. Mash bananas with a fork or slotted spoon. Add oil and mix with a fork or whisk until combined. Add brown sugar and mix to dissolve. Add eggs and beat well. Combine all dry ingredients in a bowl and add into banana mixture. Mix until no dry flour remains. Add chocolate chips. Spray or grease muffin tin, or line with tin liners and pour batter into the muffin tin, then bake for about 15 – 20 minutes until golden brown and a toothpick comes out clean when poked into the center of the muffin.